Game of Thrones is a Facebook strategy game set in the 'A Song of Ice and Fire' universe from George R. R. Martin’s book series. The player becomes a noble and swears fealty to one of the four houses from the book, and, my, the game lore is well developed indeed, with Tyrion Lannister being of course the wittiest advisor there is. Players build their encampments and progress through missions using Sworn Swords. There’s a reasonably complex skill system that depends on the player’s house, and players are free to branch out towards being either a ‘modern’ or a ‘truthful’ knight. Despite the fact that Game of Thrones is highly detailed, it certainly isn’t perfect: the social system adds some level of competition to the game, but that’s not enough to keep players interested in the long run. Plus, as in many such games, there’s the problem with building times that slowly become unbearably long. 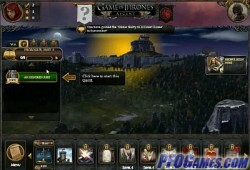 Play Game of Thrones: Ascent now!